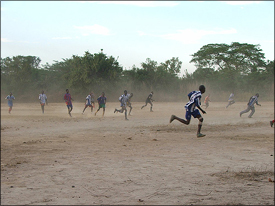 Twenty-five children were (and continue to be) sponsored through Friends of Si-Kunda. These children would otherwise have been unable to attend school; most are living in Si-Kunda, with a few who live on or near to the coast. All the children are progressing well, and are enjoying school. The school roof was replaced and the proceeds from the sale of the old corrugated iron roof paid for the paint to decorate the school inside and out. 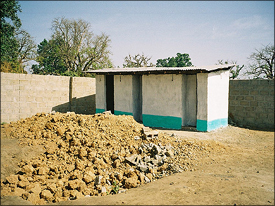 A new toilet block was built, replacing the old toilets which became too dangerous for the children to use. The old ones were holes in the ground of about two feet in diameter with nothing to stop the children from falling in. The new ones address this issue and provide much safer amenities to all. We were able to send two shipments of school and sports supplies which we distributed between Si-Kunda kindergarten, Toniataba Lower Basic and Pakalinding Upper Basic schools. Pictured to the left are some of the teachers of Toniataba unpacking the school books which were kindly donated to Friends of Si-Kunda. In September 2004 we were able to supply sufficient exercise books to last the school year at Toniataba Lower Basic school. It is our intention to continue to provide this on an annual basis. We are sourcing these exercise books in The Gambia as we endeavour to use local resources where possible. A school well was built and completed in November 2004. Since the photograph (left) was taken, a safety cover has been constructed. 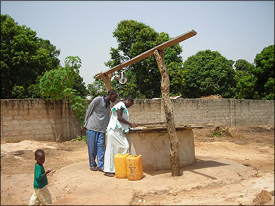 This well is used for both drinking water and for watering the school garden. The garden is prospering and the produce helps to provide the children of the school with a midday meal. Any surplus produce is sold to help with school funds. We had a second set of team football kits donated. This now means that the village football club have kits for both first and reserve teams. We have also provided footballs and trophies. A third set of kit was also donated which has been given to Toniataba school. We also now have agreement for some land to be allocated to the women of Si-Kunda to enable them to have a garden project.